Sebastopol is a short one hour trip north of San Francisco, but what a difference it makes: Same country, different planet! Come enjoy our locally-grown, spirited, organic community. Driving from San Francisco, cross the Golden Gate (Highway 101) heading north. There is no toll this direction. Rejoice as you pass through the Rainbow Tunnel, a whimsical reminder of a bygone era when, in the 1970’s, a CalTrans engineer Robert Halligan, decided to paint the tunnels with a rainbow some say as a nod to Dorothy and the Wizard of Oz. From the Golden Gate, travel up Highway 101 through Marin County and into Sonoma County, approximately 45 miles. Take Exit 481B (Highway 116 West), turning left when you get to the bottom of the off ramp. Follow what is known as the Gravenstein Highway through farmland and vineyards for about 8 miles to Downtown Sebastopol. 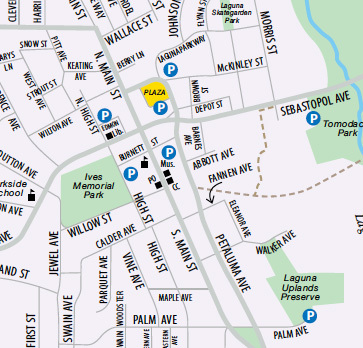 The easiest parking is available by turning left on Burnett St., just a block before the main intersection with Bodega Ave. (Highway 12). The entrance to the Parking Lot will be on Burnett St, mid-block on the left. The Sebastopol Chamber of Commerce and Visitor Center is adjacent to the Parking Lot at 265 South Main St.
A little known fact is that most of the things there are to do or see in Sebastopol are an easy walk from downtown. Rather than hassle the traffic, help the planet. Park your car and walk! You’ll be amazed at how much more you will see. Plus, you are very likely to get into conversations with locals. We are a friendly bunch and happy to help a visitor learn more about our town. For more information, contact Sebastopol’s Visitor Center at info@sebastopol.org. You can call them at 707-823-3032, or stop by (265 South Main Street). The Visitor Center is open Monday – Friday 10:00 – 5:00, and Saturday 10:00 – 3:00. They also have an outdoor rack with maps, brochures and information available 24/7. Pick up a large, paper, foldout map at the Visitor’s Center. 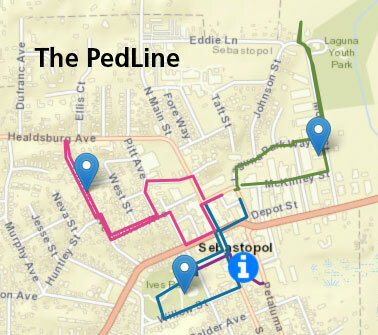 Ditch the car and “Walk the PedLine,” Sebastopol’s color-coded, self-guided walking tours. The Green Line: to the Laguna de Santa Rosa, internationally recognized wetlands and birding site with winter and spring flash-mob kayaking. The Pink Line: to the Florence Avenue Art Walk, where the folk art sculptures of Patrick Amiot are on display in neighborhood front yards. The Blue Line: to Ives Park, site of many local festivals and home to the Sebastopol Center for the Arts and the 100% solar-heated Ives Pool. The Purple Line: connecting the Joe Rodota Trail to Ives Park. You can view the map from your smartphone with your location identified. As with all GPS programming, your location will be approximate. But it will give you an idea of where you are and where you can go, by simply following the routes. Sonoma County has many attributes, but “West County” is synonymous with artists, free-thinkers, organic food and green lifestyles. Sebastopol is certainly the gateway to West County, and from here you can take easy and scenic day trips to the Sonoma Coast (west out Highway 12 to Bodega Bay), the Redwoods and the Russian River (north up Highway 116 to Guerneville), or to local wineries and farms.